Most of us are looking forward to the long weekend that starts later today. (In Nobleton, the Victoria Day weekend marks a special time as a community, when we celebrate on Monday with a parade through the streets of town, followed by a ‘fun fair’ at the community centre, and an amazing fireworks display in the evening.) Everybody knows that it’s a long weekend. But if I asked you what yesterday marked, would you know? 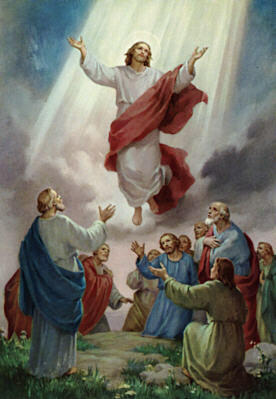 Many of you would know that yesterday was Ascension Day, the day marked by Christians to celebrate the time, forty days after the resurrection, when Jesus ascended into heaven. Ascension Day is not the most popular feast on the church calendar, but it is an important day. It underscores the importance of Jesus’ birth, teaching ministry, death, and resurrection. Without the ascension of Jesus, who “sits at the right hand of the Father” according to the Apostles’ Creed, his role as our one true Intercessor would be missing. Without the ascension of Jesus, the promised Holy Spirit would not have come to dwell within us as happened at Pentecost, ten days after Jesus ascended. The disciples were baffled, of course, since they thought the resurrection was the end of the story, and that their ministry with the Lord would carry on as before the crucifixion. But that was not God’s plan. No, Jesus assured the disciples that God had another plan for kingdom ministry. It would be done through them: “But you will receive power when the Holy Spirit comes on you, and you will be my witnesses in Jerusalem, and in all Judea and Samaria, and to the ends of the earth” (Acts 1.8, NIV). At this, Jesus was taken up into heaven, and his friends stood there, agape, staring up at the sky. It took a couple of heavenly messengers to remind them of what Jesus had said, and to assure them that he would return, one day, as he had ascended. With that, the book of Acts continues to retell the unfolding story of the life of the early church, beginning with the appointment of Matthias to replace Judas Iscariot, and the coming of the Holy Spirit on the gathered believers. That same commission, given to the first disciples, is given to disciples today, as well: “you will be my witnesses.” Ascension day reminds us that we are called to carry on the work of Christ in the world, sharing his truth and compassion with people locally (Jerusalem), in the region (Judea and Samaria), and all around the world (to the ends of the earth). Ascension day reminds us that the mission of God in the world is ours to carry out, under the promised guidance of the Holy Spirit. That’s why I love the Nobleton tradition of celebrating Victoria Day as a community, because it allows me to be a witness for Jesus in our town. And that’s a start. What will you do this weekend, or next week, to be a witness of Jesus where you are?